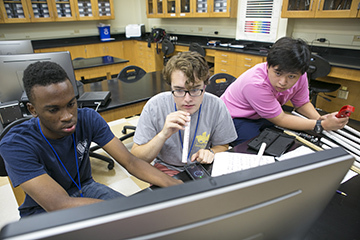 A total of 92 of Alabama’s best and brightest rising high school seniors will convene at Samford University Sunday, June 12, for the annual two-week Alabama Governor’s School honors program for academically gifted students. This year’s participants represent 54 high schools in 25 counties. During AGS, the students will attend morning and afternoon classes in major and minor areas of coursework. Major course topics include health care, law, business, research science, arts, video production, magazine writing and physics/engineering. Minor courses cover web design, photography, film studies, classics, field biology, astronomy, leadership, global citizenship, sports medicine and creativity. According to AGS Director George Keller, the health-care course is a perennial favorite with participants. During daily morning seminars, the 20 students in this year’s class will take field trips to local hospitals to observe health-care workers in action. “Students don white lab coats as they learn about medicine, dentistry, pharmacy, nursing and other health professions,” Keller said. The course is led by Samford nursing professors Rebecca Warr and Jill Hightower. Many former AGS students who took the health-care course as high school students have gone on to pursue satisfying careers in the profession, Keller notes. One such AGS alumna is Amanda Tapley, now a resident in emergency medicine at University of Alabama at Birmingham School of Medicine. A former Miss Alabama and a talented pianist, Tapley will play the prelude and postlude at this year’s opening ceremony. Birmingham physician Tyler Fuqua, founder and president of Not Forgotten ministry, will speak at an Insights dinner on Tuesday, June 21. Not Forgotten is a nonprofit organization that seeks to provide for the physical, educational, emotional and spiritual needs of vulnerable children in Iquitos, Peru. Fuqua is assistant professor of internal medicine and pediatrics at UAB School of Medicine. AGS students will participate in a community service project in Woodlawn on Tuesday, June 14, attend a Barons baseball game, and enjoy other excursions and course-related field trips. They will also hear informative talks about the college admission process, scholarships and adjustment to college. AGS participants are nominated by their schools on the basis of academic ability, leadership qualities, creativity and community service. Selection is also based on teacher and guidance counselor recommendations, and written essays. The closing ceremony will be at 10 a.m. on Friday, June 24, in Brock Recital Hall.